We’ve all seen the reeds being pounded flat to make papyrus, an early form of paper, in Spaceship Earth. Across the globe there are similar scenes that have played out during the creation of materials which were suitable for writing, artwork and fabric. 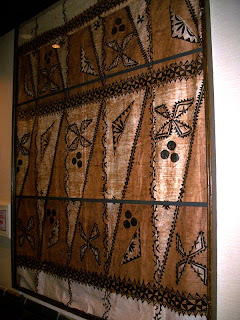 One such art took hold in Polynesia and can be seen near the elevators at the Polynesian. The Polynesian art form known as tapa was created out of the necessity for clothing for several centuries. The arduous task of creating the material starts with scraping the inner bark of the mulberry and breadfruit trees from the outer bark with a shell. The bark is placed on hardwood and pounded flat by another piece of wood, often a club like tool, all the while being kept wet and malleable. Layer upon layer of the bark is added into the fabric with the same application of force. After the desired length of material is completed, it is moved out into the sun to dry. It is then that natural pigments, mostly blacks and browns, are applied. The once common cloth was used a regular clothing, with designs crafted to denote status and rank, but it is more commonly used today for ceremonial affairs. Outside of attire, works of tapa can also be found as curtains and drapes, blankets, room dividers or as ornamental tapestries. The art has been declining, in practice, not in quality, for quite some time. Luckily for guests of Walt Disney World there is still a fine example of the beautiful art form to be observed in the Polynesian.